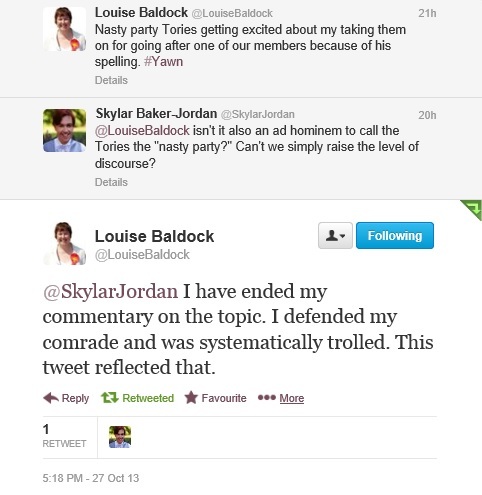 Just a quick word on the Louise Baldock brouhaha. See, I was actually a minor part of this skirmish, trying to be a voice of reason in an otherwise trivial melee. 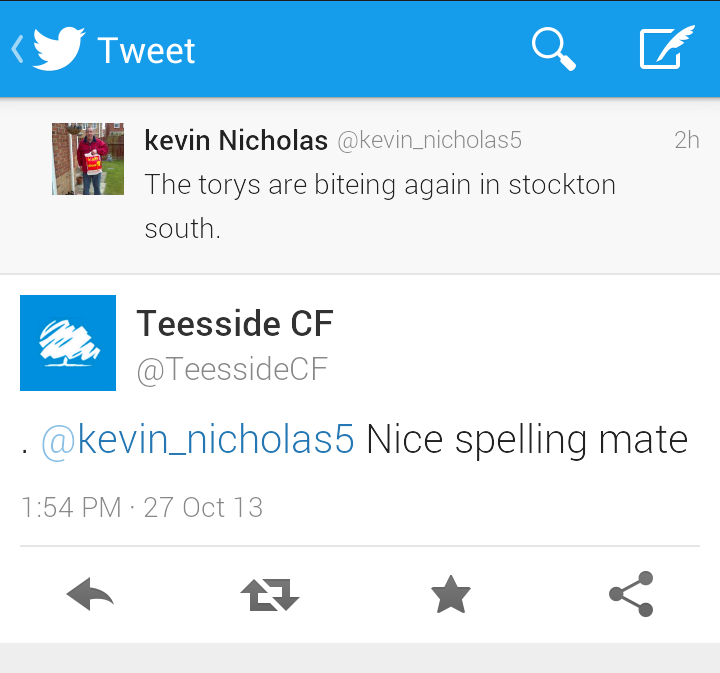 So then, Gareth Anderson, a Conservative councilor from somewhere or another, starts tweeting examples of Labour bullying of Tories. I tell him that yes, I’m equally appalled. The bully can strike from the right or the left. The victim is still left battered. Isn’t it just as much a logical fallacy to label the Tories the “nasty party” (not to mention trite, tired, and redundant)? Of course it is. Louise says she has no more to say, and that’s that. I figure the conversation is over. Well, flash forward to this evening, and Guido Fawkes has picked up the exchange. Say what you will about Guido Fawkes, but he’s pretty clever when it comes to digging up dirt on Labour. So naturally, he found an example of Louise Baldock, who criticised the Tories as elitist for bashing someone’s spelling, doing just the same. Unbelievable. No wonder Russell Brand wants a revolution. This entry was posted in Politics, Twitter and tagged bullying, classism, Conservative Future, conservatives, elitism, Gareth Anderson, Guido Fawkes, labour, Liverpool, Louise Baldock, PPC, spelling, Stockton South, tories, Tory, trolls, Twitter on October 28, 2013 by skylarjordan.